Throughout the month of November, BBHCSD students participated in the annual Yuletide Hunger Drive by collecting non-perishable food items and household supplies for local families in need. To help build excitement and awareness for the annual food drive, each building featured a variety of student-based incentives and activities. 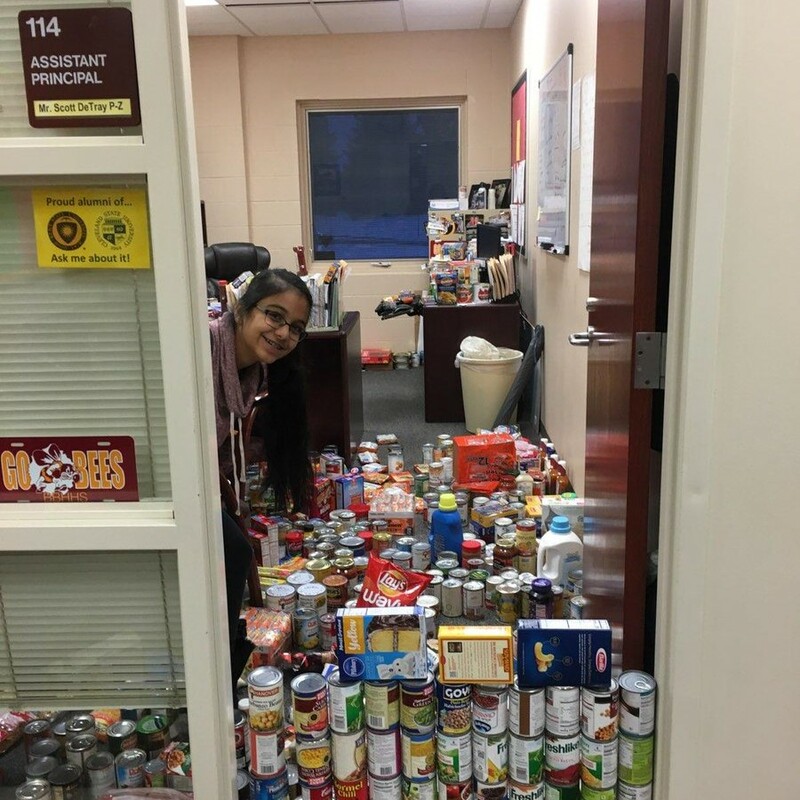 Brecksville-Broadview Heights High School homerooms and student council worked hard to ‘can’ Assistant Principal Mr. Scott DeTray by filling his office with a record number of more than 15,000 items! Students at Chippewa Elementary received a colorful holiday light to place in the windows of the gymnasium for donating, filling the room with holiday colors to symbolize their generosity. Central Principal Colleen Toth and Assistant Principal Bryan Bedford issued a fun challenge to all Central students to donate more than 2,500 non-perishable food items and household supplies. As an incentive, both principals asked students to submit costume ideas and pledged to randomly select and wear one of the suggested items if students successfully met the challenge. Altogether, Central students collected more than 3,000 items to help local families in need! To celebrate the successful food drive, both principals traded their professional attire for Peanut Butter and Jelly costumes, wearing them for the entire school day on Monday, December 3rd. Thank you to all BBHSCD students and families for supporting the Yuletide Hunger Drive and spreading holiday cheer!